Learn to move in different ways around each other without touching. Move around the room individually or in short lines weaving in and out of each other. Adapted by Dany Rosevear. A different take on the bean game and a good warm up activity. Also try with BROAD BEANS! BAKED BEANS! Wait for instructions (jumping beans) then jump vigorously, turn round and repeat. Do the same with other movements. 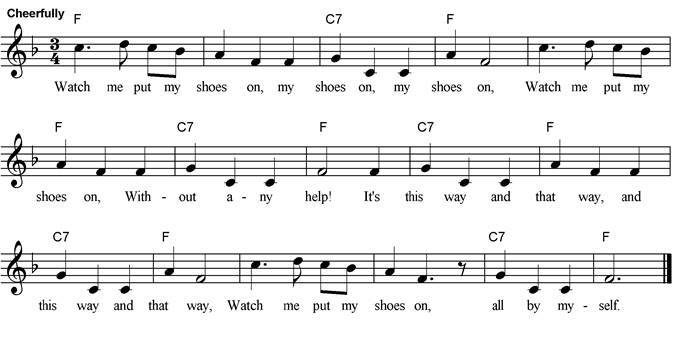 A German song translated into English by Mabel F. Wilson from ‘Music time’ a infant teacher’s classic music book in the 1960s. 1, Open and close thumb and forefinger. 2. Move fore finger like a worm. Make hands fly. This song comes from Morocco but the words are nonsense ones as in ‘Hey diddle diddle’. It is now popular as a two or four part round and as an action rhyme both in the Scouting movement and with more simple movements for young children. First time sing at normal voice. Second and third time sing faster. A rafi: shoot hands up high and wiggle fingers. Guli guli guli guli guli ram sam sam. A good movement song with a lovely quiet ending. 1. Hold palms out and turn them over. 2. Put palms together and wiggle from side to side. 3. Flap elbows up and down. 4. Flap hands up and down. 5. Hands open and close like beaks. 6. Suat down with hands to the cheek. When they dabble at the bottom of the pond. When they’ve dabbled at the bottom of the pond. When they snuggle up to mother in the pond. A popular song in scouting and also as an action song for pre-schoolers. Play as below or just the first verse a little bit faster each time it is sung. It is also a great song for making up your own rhyming verses – I made up the third one. Mime moving like each creature, travelling around the room while giving each other plenty of space but also showing others how well you are doing. That I was born a baby duck?! So I may go whereever I choose! Quack quack, quack! GOOOOD ducks!!! That I was born a baby bunny! I bounce around upon my toes. Bounce, bounce, bounce, GOOOOD bunnies!!! For I was born a busy bee. Visit flowers and make good honey. Buzz! Buzz! Buzz! GOOOOD bees!!! ‘Cause I’m as smelly as can be. I’m a skunk, skunk, skunk, skunk, skunk. Chant the months of the year to ensure familiarity and help each child to identify the month they were born. Stand in a circle and each child moves as directed when their birthday month is sung. If your birthday is in December, give three cheers! A simple partner game from Deanna Hoermann’s wonderful ‘Catch a song’. The children could play this in a double circle moving on each time to a new partner. Once children can play the game with the first verse eaily introduce different actions; children can suggest other movements to make. Children stand opposite a partner in a space. Make the actions suggested by the words as they sing. On the last line wave and turn to find new partner. Shake hands with your partner! A song from the BBC TV Series ‘Bang on a drum’ songs from Play School and Play Away published 1973. Words and music by Peter Charlton. Build towers from building bricks as you sising, cardboard boxes, egg cartons – anything or the actions below. 1. Put one fist on top of the other in time to the musi getting higher each time. 2 Repeat with a big stretch. 3. Hold up fingers one at a time then make a wobbley jelly with hands. 4. repeat first verse and actions. Build it up, up, up into the sky. Build it up, up, up, up, up into the sky. You can build a tower right up to the ceiling. You can try to build a tower to the sun. Are you sure you can balance on some more. Watch it wobble like a jelly on a plate. A lively game using the whole room as a space or the outside if possible. The words tell you what to do,; children might like to suggest other actions. Written by Lindford Holgate in ‘Playsongs from the Nursery School’. Can you walk on two legs, two legs, two legs? Round and round and round? Can you hop on one leg, one leg, one leg? Can you wave with one hand, one hand, one hand? Can you wave with two hands, two hands, two hands? This is one depending on the age of your pupils that you can speed up each time it is sung; great fun for community occasions. 1. Wiggle body. 2. Wiggle left then right arm. 3. Flap crossed hands like wings. 4. Crawl low. 5. Finger and thumbs make make a circle. 6. Stretch arms above head. 7. Clap to left, right then point to self. 1. Flop body to left then right. 2. Hop on the spot. 3. Wiggle arms in front like a snake. 4. Shake body. 5. Flutter hands. 6. Spin round still flapping. 7. Clap to left, right then point to self. Originally written by Deanna Hoermann to a simple Hungarian tune, particularly suitable for young children, in sol-fa: so.so mi.mi/so.so mi/ x3 so.fa me.re do do. She also suggested playing a game where caterpillars crawl on the floor and on the last line the magpie swoops down and catches a child who becomes the next magpie. The tune below and last three verses were written by Dany Rosevear. Verse 1: Wiggle forefinger, put finger to lips, cross hands to make wings and flap, wiggle finger, wave hand. Verse 4: Make hand into fist with first two fingers out for snail then interlace fingers to make hedgehog. Trying not to make a sound. A happy, happy song from the past with community fun thrown in. You will need to play this unaccompanied with young children. 1. Fingers make raindrop, clap twice, repeat. 2. Throw out hands and place on chest. 3. Clap hands x3. 4. Put up relevant part of body and move or wiggle it to the rest of the verse. The lively tune of Old Joe Clarke is a great accompaniment for energetic movement. Encourage children to suggest their own actions. The actions speak for themselves, continue the movements through the La las! 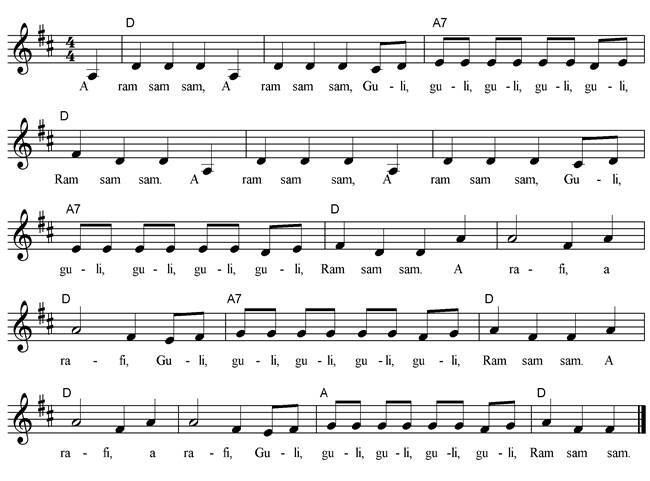 Alternatively skip round in a circle for the verses make the appropriate movement for the chorus. La la la la la la la, La la la la la la. Learn the names of different parts of your body and to differentiate between noisy and quiet movements. The actions speak for themselves! We have made a pattern. Clap, slap etc. with the words in time to the music. Work together and think positive - a community song which also works well as an action song for pre-schoolers. 1. Climbing actions, draw sun and make a mountain with hands. 2. Hands make breeze movements. 3. As before. 4. Put hands to face. 5. Turn around, fist under chin. 5. Stretch arms above head. 6. As before. 7. Point to another child and then self. Reach up to the skies. An Antipodean action song popular in scouting and also with pre-schoolers. Koalas squat and hug selves. Possums make rings round eyes with hands. Wallabies and wombats swat alternate paws. Kangaroos jump up and down with paws in front. Lions and tigers make hands prowl. Make long neck with arm for giraffe. Swing an elephant trunk with arm. Make snapping crocodile jaws with both arms. Scratch under left then right armpit like a monkey.